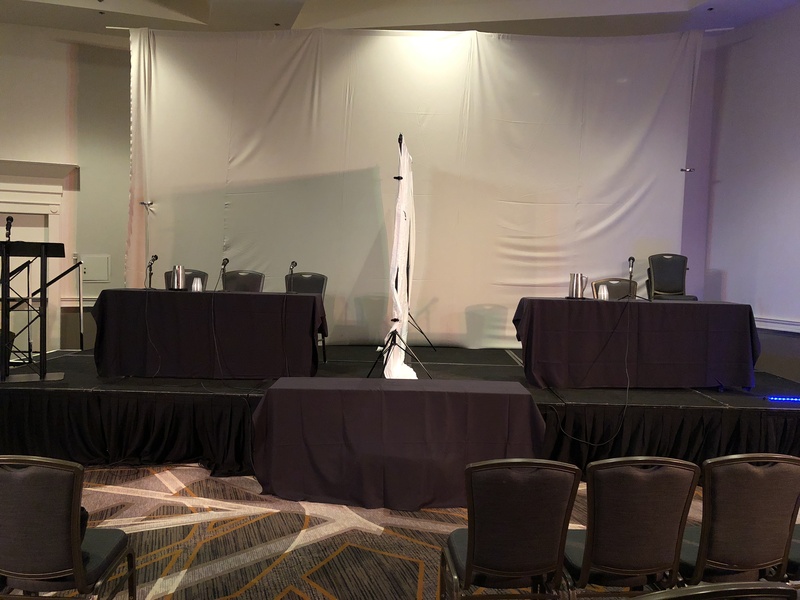 MileHiCon50 – An After-Action Report | Runnin Off at the Mouth…. ← Follow My MileHiCon50 Instagram! I went to my fifth MileHiCon50 last weekend, which was also its 50th anniversary. 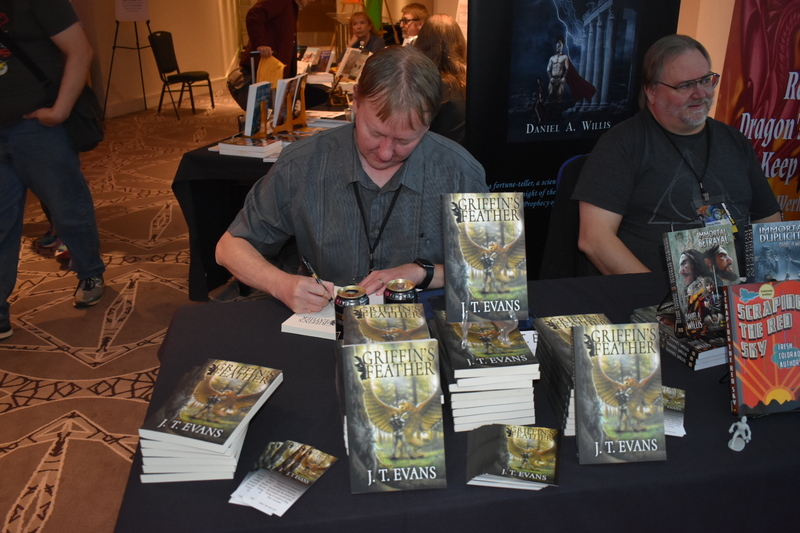 While I did not sell many books (a couple of my writer friends said “who does?”), I had a blast! Attendance was about 1,250. Staff said that there wasn’t a huge jump in attendance this year (in fact, to me, it looked a bit light this year—I mean the Tardis exhibit wasn’t even displayed! ), but that there was about a 20% jump in conference and hotel pre-registrations. Given that I had shoulder surgery in August, I didn’t know how my rehab was going to go, so I hadn’t wanted to load up in moderating panels, which meant a lot of preparation. In fact, I don’t think I even put myself in for a single moderation, but, as circumstance would have it, I was put on one, and I was thankful for that, since I had so much fun, but it was the right amount, because I was literally down to the last minute preparing for it up until about a half-hour before leaving for MileHiCon that morning! I arrived just after high noon and got my room. 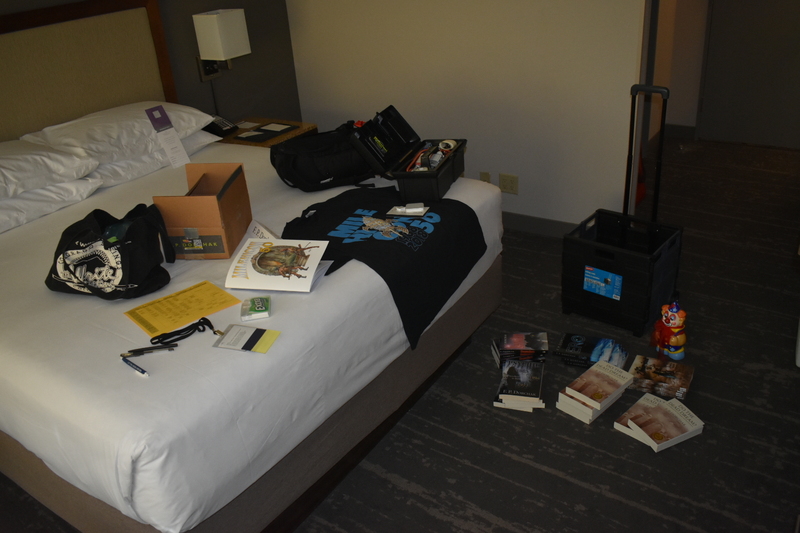 This time I left the bulk of my books in the vehicle rather than carry them all up to the room and lug them all over the place. I just brought in a couple of each. Didn’t sell them anyway, so that worked out fine—though, had I thought of this earlier, I would have given away a book-per-panel (I saw one of my panel members jump on the idea in a panel I was on, and just about kicked myself—what a great promotional idea!). 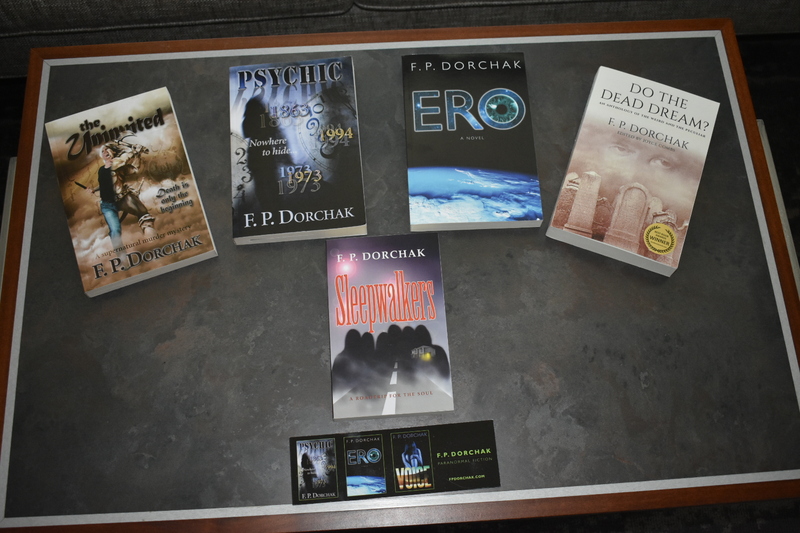 I had planned for and did give away several to the Ed Bryant Literary Auction (one collection-of-four and a single of Do The Dead Dream? ), and after realizing this opportunity, I did give away one to a guy with a creepy afterlife story he’d told the room, in my Afterlife panel, about his sister who’d died. 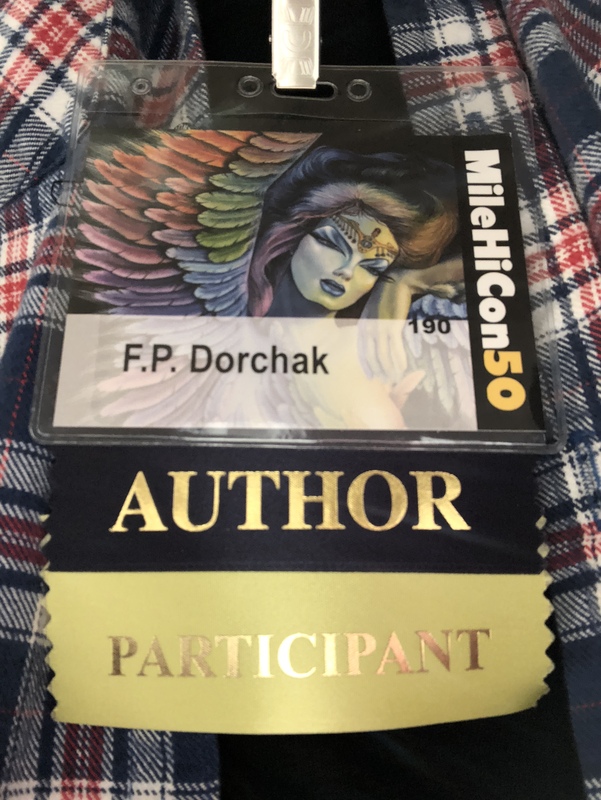 Anyway, after checking in, I got my packet of goods for the weekend: my badge, paper name “plate,” itinerary of panels I was to be on, and my 50th anniversary MileHiCon50 T-shirt I’d pre-purchased. 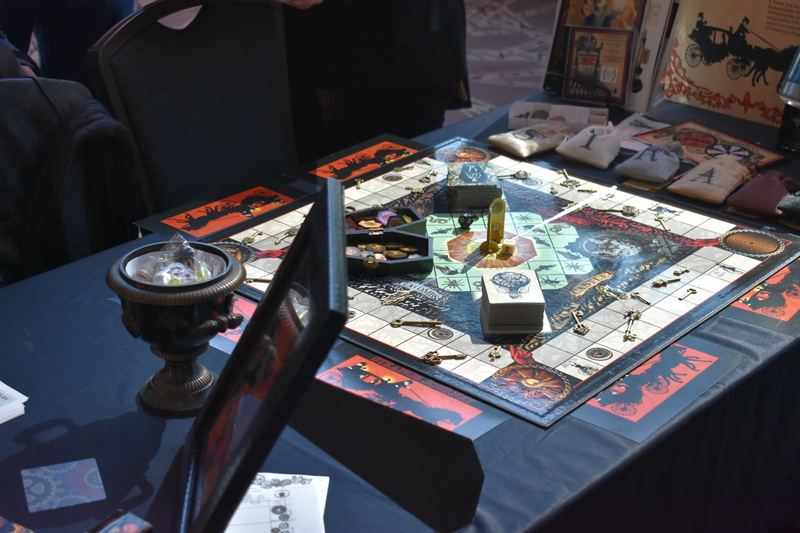 I ran into my friend Jan C J Jones, who has created a wonderful story, A Journey With Strange Bedfellows, set in 1889, which she has transmogrified into a whole world, ranging from a board game to educational resources. Her Facebook page is here. Jan and her Significant Other, Brent, were on-hand to show the fun and wonder of their game. I had not seen the final version of it, and it looks just as professional as any other commercially available game out there. I love the look and feel of it, though I have not yet played it. Jan has also created a graphic comic and a CD. We own the CD (directed by Fred Greenhalgh, music by Peter Van Riet), and I’ve seen parts of the graphic novel during its creation, and the artwork is incredible (illustrated by David Stoll). It was so cool to see Jan so enthusiastic and happy about her new project! She just has so much going on with this, and really has created quite the “corporation”! The very first panel I’d attended (in the audience, not on the panel), was “Tips On Being An Awesome Panelist,” moderated by Wil McCarthy. Stace Johnson, Becca Lee, Carrie Vaughn, and Meg Ward were on it. 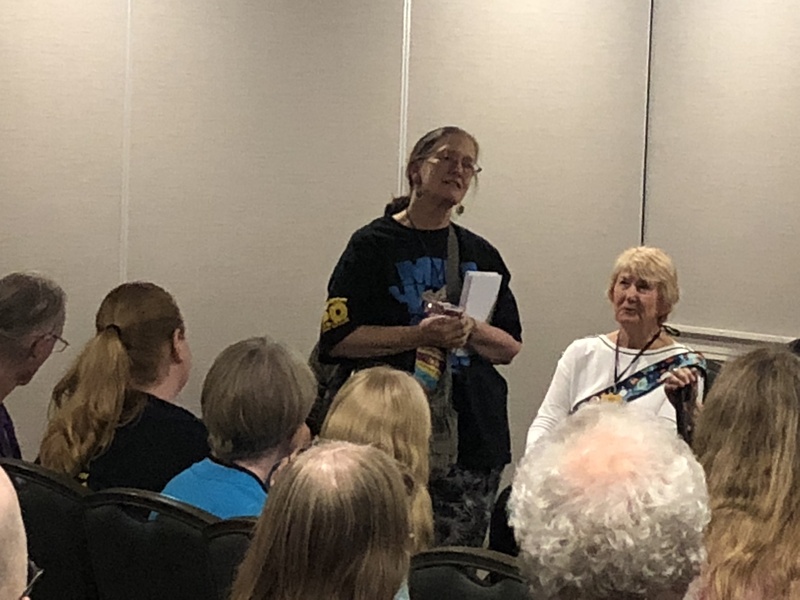 There was so much good information from these veteran VIPs, but the one really good piece of advice I got out of it all was from Carrie Vaughn: don’t stress out over being on a panel! There were some panels, Carrie said, that she plans for…does some research and collects talking points…but most of them she just tries to free-wheel. She usually knows something about the subject and doesn’t do much, if any prep. She just goes and enjoys wherever the panel discussions talk people. As I thought over my experience I realized that that’s what I do as well: I’ll generate some talking points, but I also go with the whole idea of just having fun and going wherever the discussions take us. To be honest, I don’t think I’ve ever used most of the talking points I’ve ever written down, as I look back on things! I’ll take notes on them, from points brought up…but rarely do I seem to use most of what I research…unless I’m the moderator seeding the discussions. So this was quite revelatory, even given that that was what I’ve tried to do over the few years I’ve done this. It was great corroboration! I’d checked out many sessions and panels, and a couple of movies. Got into conversations between-and-during panels, but the Masquerade was a lot of fun! I haven’t hung at one before, so this time I did. Though one skit had sound problems and went on just a wee too long, it was fun seeing all ages having fun dressing up and performing tiny skits to go with their costumes. Judges sat before the stage and rated and chose winners, which were announced sometime later. After this was the Ed Bryant Literary Auction. I’ve seen auctions before—have even seen this one—but didn’t want to stick around. I had put some of my books up for auction and just couldn’t bear to see how the bidding might—or might not—go. After sticking around for the beginning auction, and one item had no bid on it, so the MC stepped up, yeah…didn’t feel like seeing that if it happened to my books…. I’d of course run into many of my writer friends, which was great. 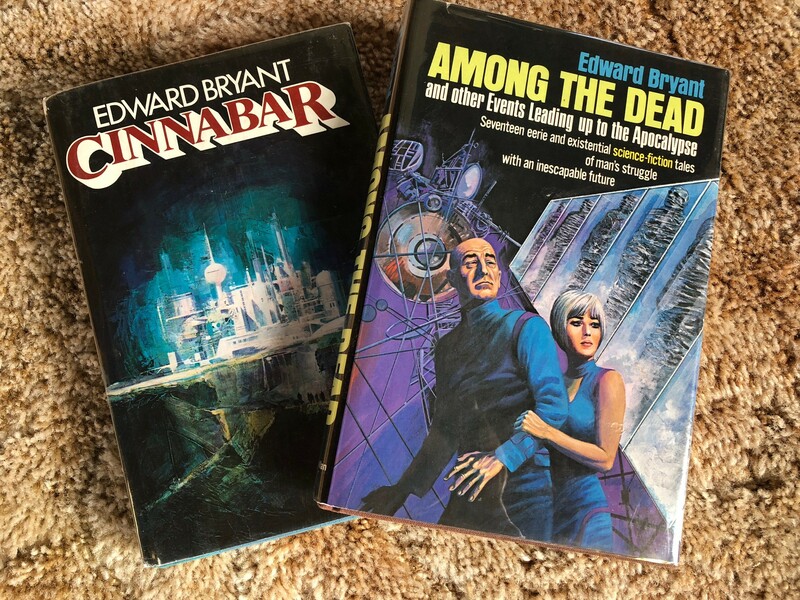 Ran into the two guys (Jean-Philippe Gervais and Stace Johnson) who are putting together (as much of possible) a full collection of Ed Bryant, Jr.‘s work. He was another writer friend of mine, but he’d passed away last year (February 20, 2017, at the age of 71). He wrote across the gamut, everything from fantasy and SF to comics and reviews. We weren’t close friends, but every time we met he acted like we were and had even expressed that he’d wished we had spent more time together. I met Ed years ago, at a Pike Peak Writers Conference in Colorado Springs. I’d heard he’d had an invitation only critique group and just went up to him and asked if I could join, since, by then, we’d gotten to know each other a little. I’d run into him off and on, through e-mails and in-person, over the years, and he was always fun to hang out and talk with. We finally even managed to be on a writing panel together at Denver’s Comic Con in 2016, which was an honor. Just let him know you’d like to be added to his list for the Ed Bryant books. I did so while at MileHiCon50, and he got back to me the very next day. The first two volumes will be limited to about 1,000 copies, and maybe something like 300 for Volume III, which will be more nonfiction and reports, etc. The books will be in the $75 – 95 range, and will be hardcover. Volume IA will also have a DVD of the book (not entirely sure what is to be on it). I was part of this panel, where we briefly discussed what we thought fantastical prose was, then read from a selected work of our own. I was originally going to read from “Freefallin’,” because I thought we had very limited time and it would be more discussion than reading, but since that proved not to be the case, I decided to read from “What Dreams Are Made Of,” instead. This story is one of the weirdest I’d written…and true to form, it got people to asking stuff like “who’s dead in that story?” Unfortunately for them, I had to say that were I to tell them, it would severely spoil the story. And it would…because it is weird. But I went on to say that there can be different levels or varieties of “fantastical” stories…but that ultimately, they all strive to be weird and out there..deviate from the generally accepted “norm” of the day…something totally different to everyday life…and that that can vary from writer to writer, obviously. Or words to the effect. It’s been a few days now, and everything’s a blur…. After the auction I’d decided to watch Something Wicked This Way Comes. This is a movie I used to like…until now. It was kinda sexist, I’d discovered! There was a lot of focus on beautiful women in one way or the other, which never “hit” me before, and I’d felt the “topic” had been too saturated for the movie, which Ray Bradbury had written and adapted for the screen. That kind of surprised me. I guess I was just more sensitive to the issue, given the MileHiCon50 weekend was filled with talk about representation, diversity, agency, misogyny, etc. So, I’m not sure and will definitely have to rewatch that film again, but the film involved an aging woman’s vanity, a really horny guy, and a beautiful-but-evil sorceress type. 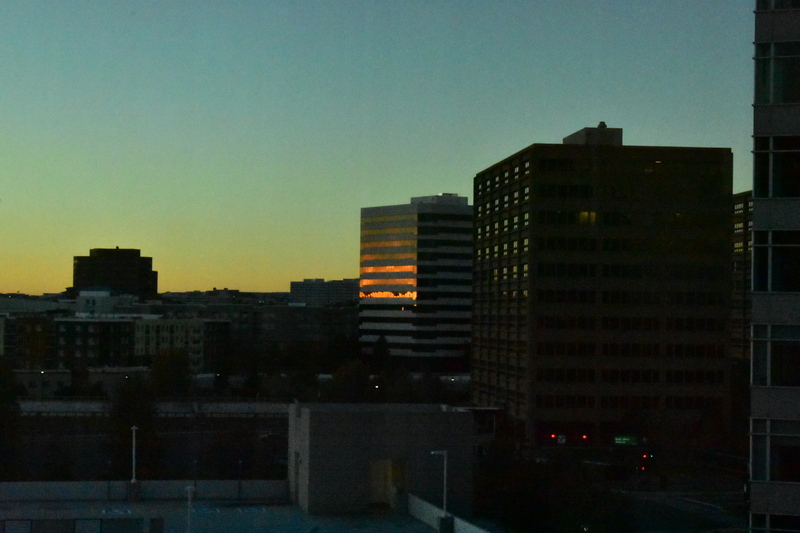 That all just seemed like over-exposure. Yes, there were other issues, like lost youth, hurried youth, quiet desperation and unfulfilled lives, etc., but the way that women were portrayed in the movie just hit me…. I’d also watched a little about the making of/tribute to 2001: A Space Odyssey. It was interesting to see the actors talking about the making of the movie, which I’d never seen. I didn’t catch it from the beginning, unfortunately. I love 2001…it’s such a creepy movie! The most disturbing thing I’d seen involved Teddy bears. Yeah…the once cute, cuddly little creatures. Luckily I have no images, since cameras were not allowed in there, which is a pity, since I could have posted stuff here and promoted their work, but I get it that the unsavory few who like to “be evil” with other people’s work spoils it for the rest of us. I don’t know if that means that the bears were intentionally distressed by the artist (Charles McLean Redding)…or that the artist merely found them in a state of distress then cleaned them up. Though my definition of “restoration” and the artist’s are quite different! Obviously, these bears had been restored in a distinctly dystopian restoration, which, while “upsetting” on many levels, was actually quite creative on others! Think Mad Max, or any other dystopian favorite. These little critters are called “Wasteland Bears,” created by The Fire Thieves Studio. And, well, a bit disturbing…especially when juxtapositioned over the cute, little Teddy bear concept. The Fire Thieves Studio designs, crafts, and performs maskwork (I loved his some of his masks—see below), puppets, games, music, and theatre. I actually saw one person at the con had actually bought a Teddy bear and was walking around with it. Yeah, neat concept, Mr. Redding! I was also really was drawn to some creepy mud masks that also turn out to also be done by Mr. Redding. These look straight out of The Night Gallery, and I really wanted them (especially this one, called “Thalassophobia“). Yeah, my wife would not like these things hung up anywhere in the house—and I totally would not blame her. But I loved them…and, yeah, they did inspire me to write a story or three. Another art-of-note was work by Kyle Crutcher. I really love his work! He does more than SF/F work, but I love his genre work! It’s so cute and cuddly and whimsical and Awww-that—yeah, for pottery! By and large there was a lot of really cool stuff to look at. Some great canvas-art work, as well. It just amazes me the talent of the Human Race! This was the one panel I moderated, and man, did it get crazy! 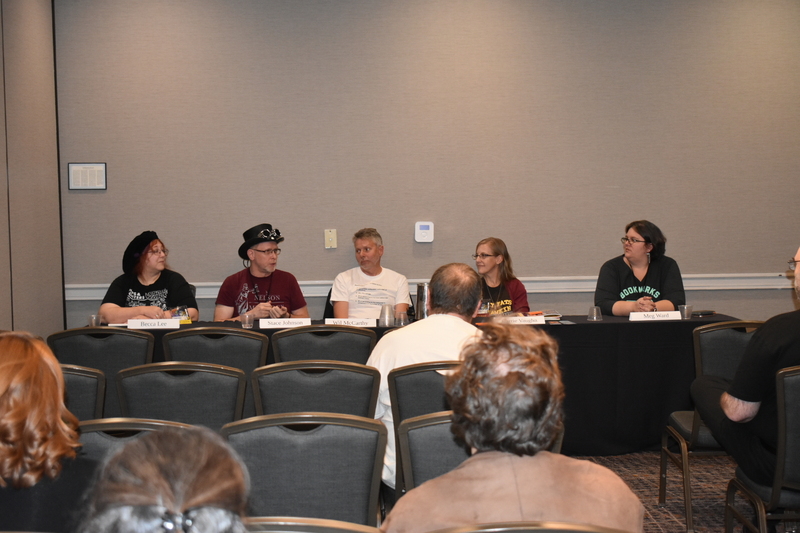 My panelists were: Joseph Paul Haines, Shannon Lawrence, AK Llyr, and Emily Mah. When I moderate I’ve taken to doing some research on the other panelists, introducing them myself. I learned this from Ed Bryant, when I had been on a panel with him at Denver’s Comic Con in 2016. He’d done the same thing, and the way he did it was classy and humorous. I liked that! It was professional, polished, and showed that you cared enough to put in some effort into your moderation, rather than just let others talk about themselves (though I get how busy everyone is and this does take some preparation). Anyway, this is what I’ve started doing, and did so with my panelists here. I had a blast with it. Shannon, a friend of mine who was also on this panel was kind enough to tell me it was “hysterical,” since I did poke some good-natured fun at her as well (thank you, Shannon!). But in my research I found zilch on one guy: AK Llyr. In fact, the way the MileHiCon50 program had been written up about him/her, I had no idea whether or not s/he was a he or a she. And all his contact info, podcasts, website, were nonexistent. So I played off of that. In fact I’d run into AK at another session a couple of hours before this one, and we’d introduced ourselves. He’s a big, massive dude, but friendly and outgoing, and we immediately hit it off. I told him my dilemma, we had a good laugh, and he said all his stuff was in works. I asked him if he’d mind me playing off all this at the panel, and he was fine with it. …sooo, I’d brought up the subject of why were there so many dystopian stories…why such interest and focus? I said that the more you focus on something, the more you bring it into reality. Literally almost everyone there took exception, saying that what those stories were doing was trying to highlight the dangers of it. Make people aware of it…even trying to solve it. Then I said, okay—but how many more examples are needed? Don’t you think there are already enough examples and “warnings” and—well, I pretty much got drowned out before finishing that sentence. I also have to say that I have not seen most of these stories showing a solving of anything—dystopian or otherwise. Only promulgating additional and future despair. Wallowing in it. Continuing it. Heck, look at the freaking sequels and copycats. Writers and readers are stewing in it. Very few if any (and I can’t think of any really, right now) show how to prevent such alternate futures…but even if they did, they still all come back to the dystopian hells. Maybe The Terminator series tries to do so, but even those just keep getting worse and worse. No resolution. So, this audience response was philosophically and metaphysically unnerving to me. As long as you have an audience for negativity, you WILL GET NEGATIVITY. You keep focusing on bad things happening, and that is exactly what you will get. No one else spoke up supporting my position, so I was definitely a minority-of-one. That’s okay, my reality is not theirs, and, thankfully, vice versa. I also get it that conflict makes the best stories. Stories where nothing bad happens don’t really move…. In general, the topic became quite animated. It never really got “heated,” but at one point it really did seem as if suddenly everyone in the room erupted at once, and I really had to wrangle back control—but I loved that! We had engaged the audience and had great discussion! We did note, however, to both ourselves and the audience about how dark the topic truly had become, so I changed direction with some more positive questions. With a topic like this, what did you expect? Yeah, I don’t want to moderate anymore topics like this. Like a sword…it’s not the sword that kills…it’s the person wielding it. Friday night, AK Llyr and I got together at the bar and hung out for some three hours, him doing nearly all of the talking—and he was not boring! His experience ranged from his early life to “lettered government,” let’s just say. His business card reads “Gentleman Adventurer,” and that is, indeed, what he is best described as. I also loved this part of his card: “Tinker, Tailor, Sailor, Spy,” and how he added “Villains Vanquished…Maidens Rescued”…and a bit more. I sensed great humility—and perhaps pain—in him. Strength. A tempered soul. He had overcome adversity and experienced terrible things…and is at the top of his field…whatever that may be (I ain’t askin’…). But he continues to echo specific and worrisome cautions for the Human Race. Our days are limited based upon our current actions and mindsets. He sees changing that as problematic…I, however, see alternate realities…probabilities…and do not believe in end-of-world scenarios. To me…Life…in some form (and I am talking human life)…will always exist. Maybe not in certain probabilities, like the ones he’s involved with…but I believe all of our lives involve our own probabilities and they intersect like massive, metaphysical Venn diagrams. For a few hours mine got to intersect with this fascinating, if enigmatic soul called AK Llyr…and I genuinely hope he can shift his focus to a more sane and livable reality. I really liked the guy. The Reading Game does not get enough promotion! This is a fun game based upon the old The Dating Game, in which we pick a person from the audience, who goes up on stage and is shielded from three randomly picked authors on the other side of a barrier. The audience member then gets to ask five questions either to a specific author or to any-or-all three. We then respond and the reader then makes a decision to which one s/he would like to read (or “go to bed with,” as Rose Beetem, MileHiCon Programming Co-Chair, put it in the intro!). The reader and writer than meet, they can talk a little (off to the side) and then decide upon a book for the reader—who then gets it for free! Autographed. As I saw it, this looked like the lowest-attended year for The Reading Game in three years. It’s really sad, because it’s so much fun and extemporaneous, and it you get more than a “Yes/No” question, it really gets us to think! The other part of this that hasn’t been pursued is that we ask the readers to please post reviews of the books they read and contact MileHiCon, so they can be posted. And, no, I was not picked this year. When I did it the first year, in 2016, I did get picked, and my book was The Uninvited. Despite all the “science” in that room…the quick-to-argue-against life-after-death proof…doesn’t that tell you something? For one thing, if you go looking for something, you’ll most likely find some evidence for what you’re looking for—both positive and negative—and may well ignore other data. Or interpret data one way, but not (i.e., ignore) another perfectly valid way, as well. Scientists are people, too, and as such, are also subject to prejudices. And these prejudices can very well skew not only their collection, but also interpretation of data. Someone this weekend said “math does not lie,” and I so wanted to take issue with that statement! Anything, including so-called neutral numbers, can be made to skew data…to “lie,” as it were. I’ve seen it first hand. You can absolutely make a certain set of numbers prove or disprove opposing objectives…depending on your manipulation of said numbers. Anything can be manipulated. If you don’t know the questions to ask…you won’t discover their answers. You cannot measure nonphysical effects with physical equipment..and measuring peripheral or associated physical phenomena tied to the nonphysical can easily be misinterpreted or ignored. Obviously energy has physical manifestations, so, yes, you can measure that. But I also feel it has nonphysical manifestations, which have not been measured—how can it? It’s not physical. So if scientists are looking for irrefutable, quantifiable data, they’re not going to find it until they find a new way of investigating these kinds of things. Just because you cannot measure something, doesn’t mean it doesn’t exist. I mentioned this toward the end of the panel. There was no retort. There were multiple examples from both sides of the discussion from the audience. I kept trying to bring up the mind and consciousness. About where does it come from…where does it go? Where does LIFE come from…how and what causes chemicals to bring forth consciousness? I was told that the mind was a byproduct of the brain (which I disagree with; I feel the brain is an interface—the physical interface for the nonphysical mind—for consciousness’s insertion into physical reality, but wasn’t able to get far with this in this panel). I do see how a physically focused scientific community would say that. There were just so many misinterpretations of “All-things death” on this panel, IMHO, it was hard to hit any of them and pursue them, because science kept being thrown up, just on its own “reputation,” and the learned people associated with science there. Science is so based on “proof”…but it’s a very specific and narrow proof that does, indeed, work on physical terms. But there are other areas of proof that need to be investigated and “re-imagined” in order for the incredibly physically focused to sit up and take seriously. Today’s most far-out physics is finally acknowledging/discovering the “weirdness of being,” with things like quantum entanglement (which directly ties into how I believe absolutely everything is tied to everything else). If energy is neither created nor destroyed…where does it go and where does it emerge when we experience it in this life? How do chemicals give us personality? Feelings? A mind? There were 25 Guests of Honor (GoH) at MileHiCon50. At the end of the weekend, 14 of them were all crammed together in one room for the Closing Ceremonies, which I’d also never before attended. The cool thing they did was start at one end, with Mario Acevedo, and each GoH introduced the GoH to their left. It was a great idea! Very amusing how each person described their peer. Cool idea! 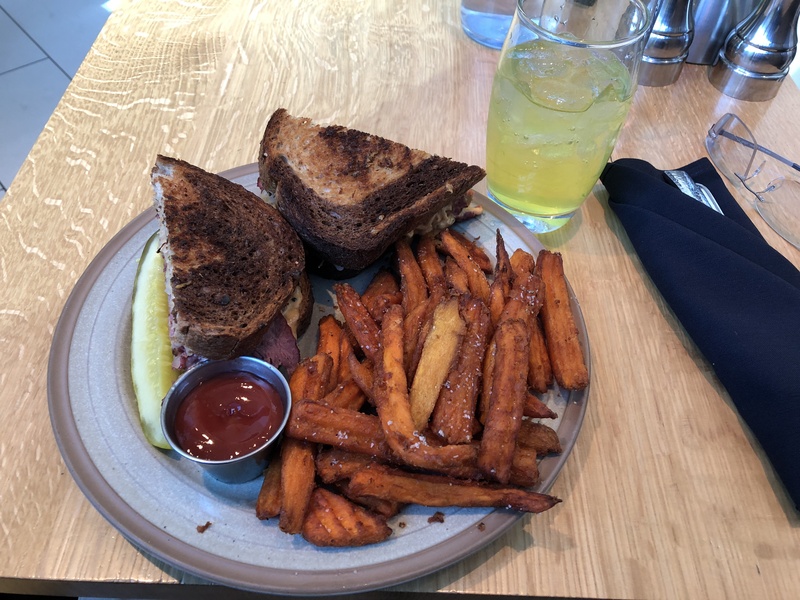 I took a picture with my smartphone, but had to cant the image to get them all in without backing up. Wasn’t quite sure how the quality would come out. 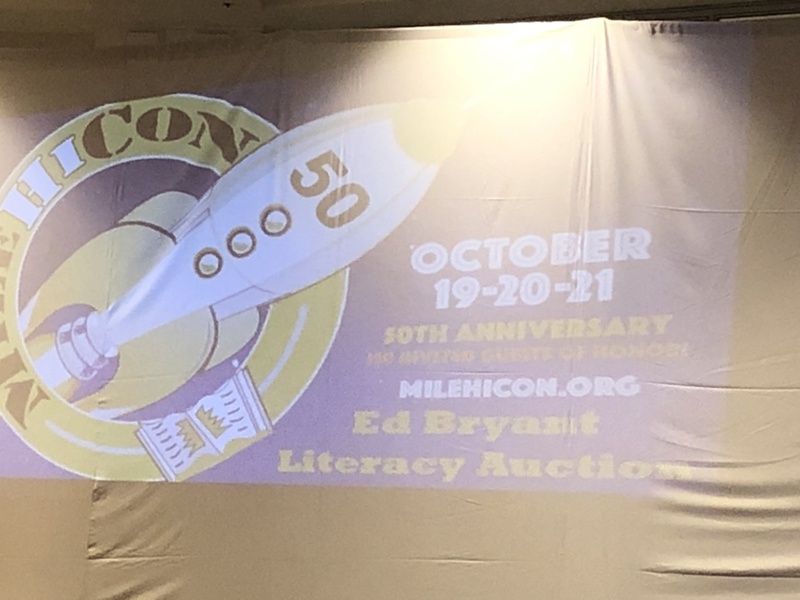 Well, that’s my term for it…but it was semi-circle of poster boards depicting the 50-year journey of MileHiCon, and it was quite entertaining and enlightening! It hasn’t always been called “MileHiCon”: Minicons 1 and 2, Octocon 3 (already taken), and, then “MileHiCon” in its fourth year (it won by two votes over the runner-up of “LungfishGranolaCon”; yes, you read that correctly). 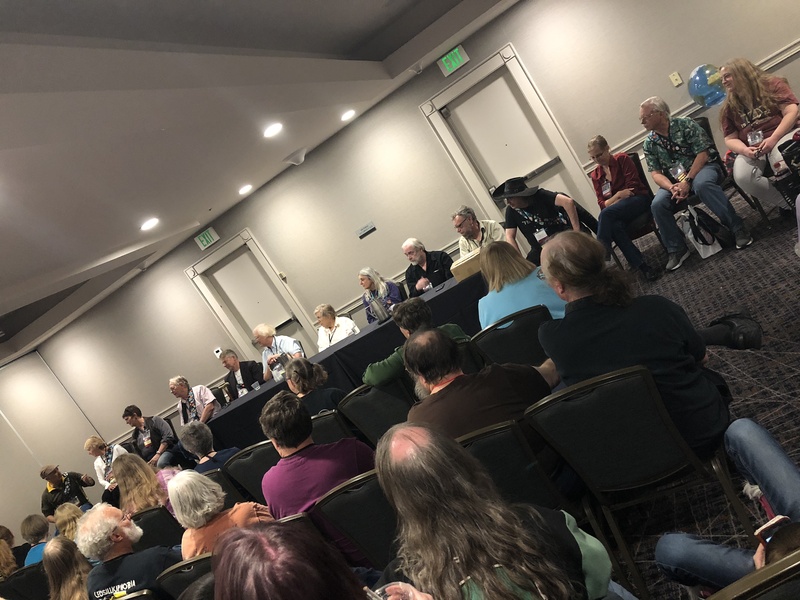 There was so much wonderful history about this wonderful SF/F/H convention, I wish I could have taken more of it in, but I’ve added what pictures I could take and include. I have permission from Rose Beetem to include them (thank you, again, Rose!). Rose Beetem is a most wonderful and grateful soul! She has been directly associated with this con, at least most currently to my limited knowledge, in the programming department, for some 30 years. She retired from that position with the conclusion of this year’s 50th anniversary, handing it over to Meg Ward. I introduced myself to Meg and thanked her for her part and wished her continued success. Rose had continued to include me in MileHiCon these past five years, and I hope that Meg also continues to include me. I simply love this convention and would love to remain associated with it! I love moderating and being on panels, but also being a part of the entire atmosphere. I’m looking forward to my continued association with MileHiCon! This entry was posted in Art, Fantasy, Metaphysical, Paranormal, Reincarnation, Science Fiction, Short Story, Space, Spooky, To Be Human, UFOs, Writing and tagged A Journey With Strange Bedfellows, Afterlife, Brandbeorn Pottery, Charles McClean Redding, Conferences, Conventions, Denver, Ed Bryant, Five Thieves Studio, J. T. Evans, Jan C. J. Jones, Kyle Crutcher, MileHiCon, Mud Masks, Technology, The Reading Game. Bookmark the permalink. Whew! Sounds busy but fun. Jan looks great. I’ve given away writing instruction books before but never had the opportunity to give away my own… we both know why… glad you weren’t overwhelmed with moderating. Thanks, Karen! It was such a great time…sometimes I go into these events somewhat stressed out from everyday life and all that we deal with…or not writing as much as I’d like to be…but once I get to these events, I immediately “get into character,” go with the flow, and just enjoy myself! And it’s so neat also running into people I know who are not writers, but fans of the genres and all (not to mention meeting new people!). As mentioned, it’s always a blast seeing writer friends! It’s like no time has passed when we see each other. Weird, huh? :-] Thanks for reading and commenting! 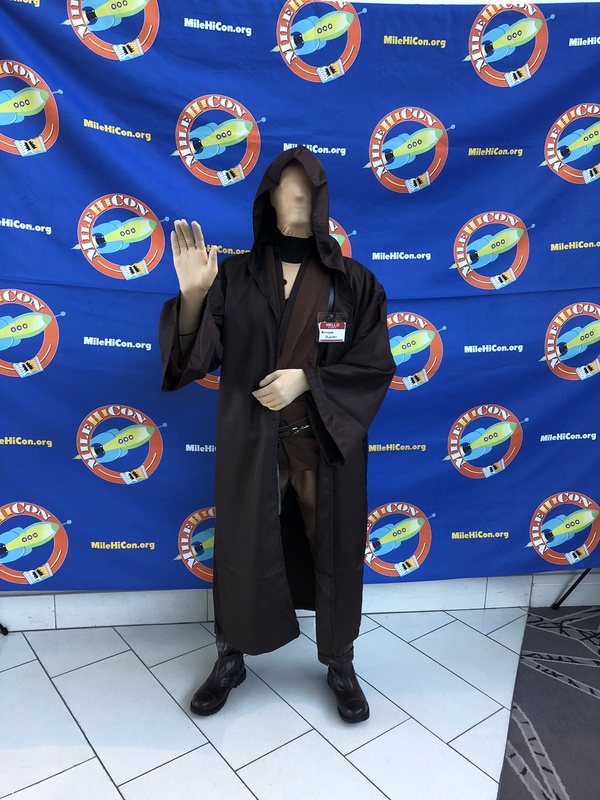 Frank, this “flavorful” coverage of Mile High Con is simply amazing!! Thank you for taking time to include my project in it and for demonstrating stalwart support in all things throughout these many many years! You’re a valued member of the writing and writers’ community and beyond !! Your project is so cool, and I hope it really takes off! We will definitely have to play it! You are also quite the creative and valued community member! Your mind is always turning…churning…working. It’s simply amazing…and you have created an amazing world! I also probably haven’t thanked YOU as much as I should for all you’ve done over the years…from photography…to screenwriting (adaptation)…to writing and promotional ideas. You have an incredible wealth and breadth of knowledge and experience and I (we) can never thank you enough for all you’ve done and continue to do! You are a giving soul and we are honored to know you!